Let’s start with defining a CDN. 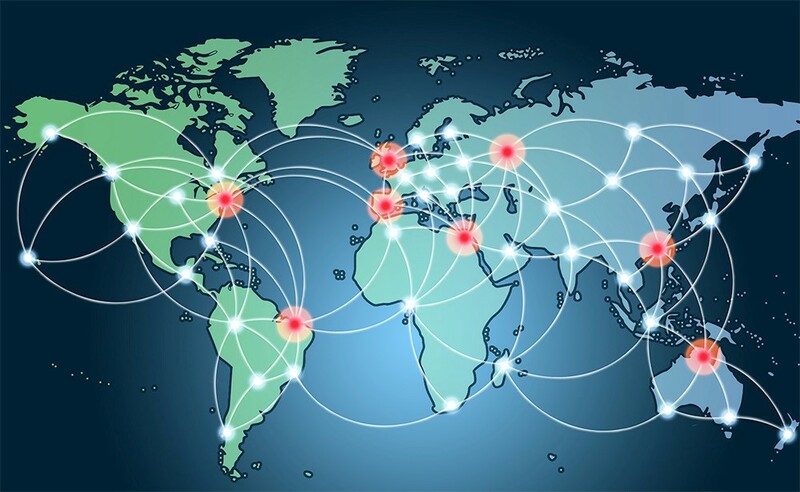 A content delivery network (CDN) is a system of distributed servers that traditionally delivers web content to a user, based on the geographic locations of the user, the origin of the webpage and the content delivery server. I use the term traditionally because we’re entering an era where CDNs are doing more than just delivering web content. 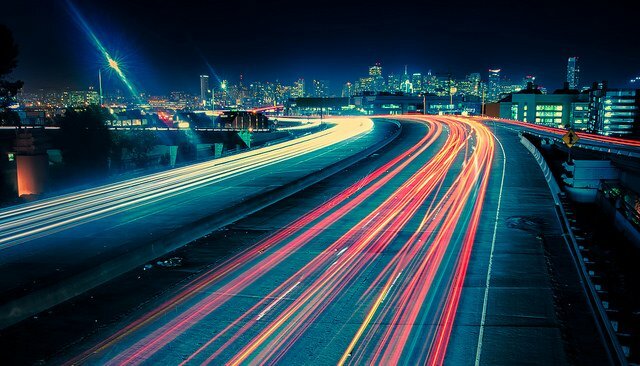 The main point is that CDNs and edge computing are continuously evolving — whereby the two are starting to meld together in an era where high scalability is paramount. Many realtime applications need to work with data that is both pushed and pulled (i.e live sports scores, auctions, chat). Separately, data push and data pull are fairly straightforward as independent entities. At initialization time, past content could be retrieved from a pull CDN and new/future updates could be pushed from a separate service. But, what if you could chain these mechanisms together? Fastly is an edge cloud platform that enables applications to process, serve, and secure data at the edge of a network. 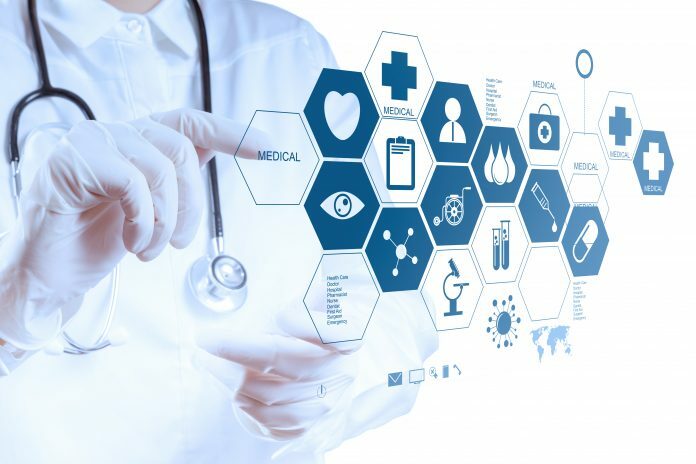 It is essentially high scalable data pull and response, using a platform that can listen and respond to users’ needs in realtime. Similar to a traditional CDN, Fastly does allow you cache content, but it also lets you deliver application logic at the edge. 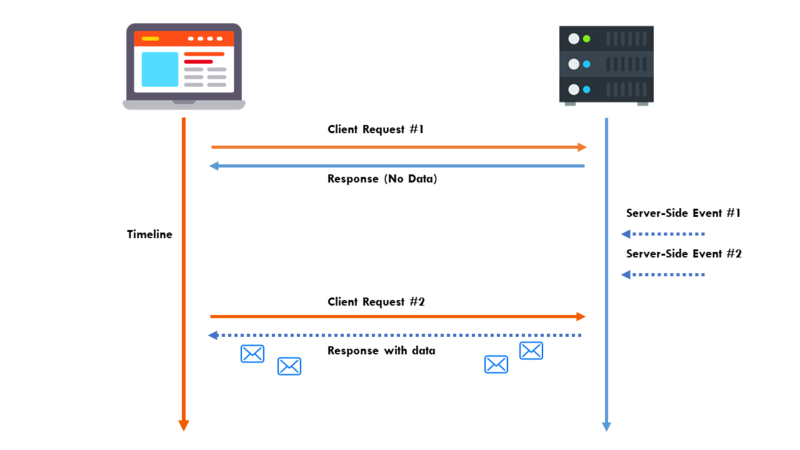 On the other hand, Fanout is high scalable data push — serving as a reverse proxy that handles long-lived client connections and pushes data as it becomes available. High availability — If your origin server goes down, Fastly can serve cached data and instructions to Fanout. 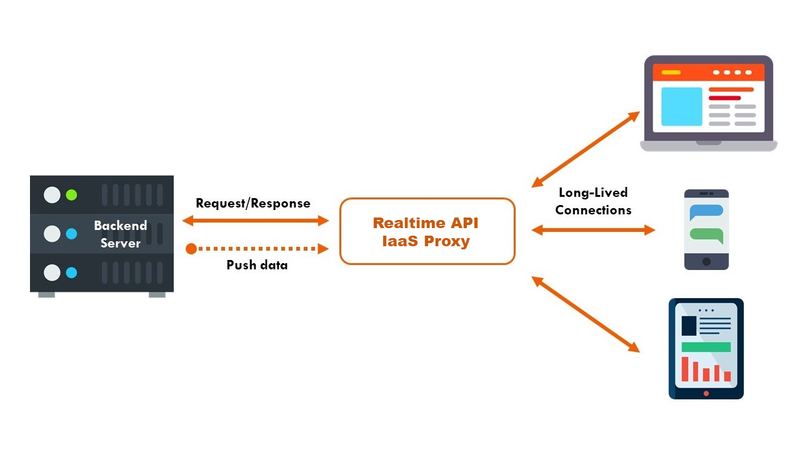 This means clients could connect to your API endpoint, receive historical data, and activate a streaming connection, all without needing access to the origin server. 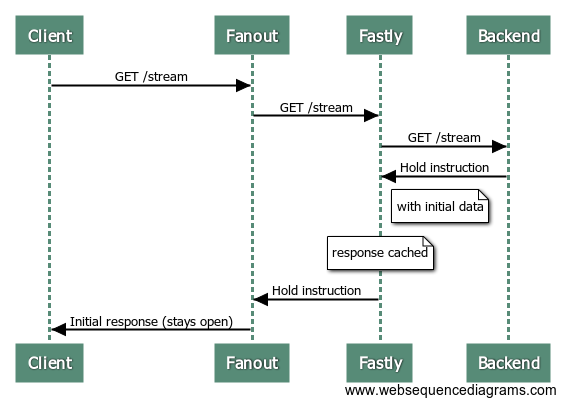 Cached initial data — Fanout lets you build API endpoints that serve both historical and future content, for example an HTTP streaming connection that returns some initial data before switching into push mode. Fastly can provide that initial data, reducing load on your origin server. 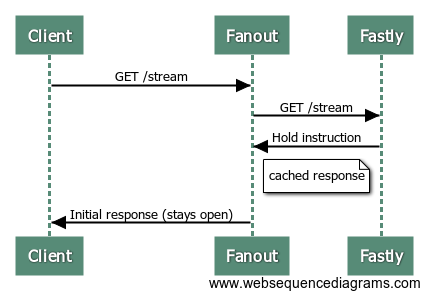 Cached Fanout instructions — Fanout’s behavior (e.g. transport mode, channels to subscribe to, etc.) is determined by instructions provided in origin server responses (using a system of special headers called Grip). Fastly can subsequently cache these instructions and headers. High scalability — By caching Fanout instructions and headers, Fastly can further reduce the load on your origin server — bringing that processing logic closer to the edge. Using Fanout and Fastly, let’s map the network flow to see how these push and pull mechanisms could work together. Since the request to the origin server is just a normal short-lived request/response interaction, it can alternatively be served through a caching server such as Fastly. 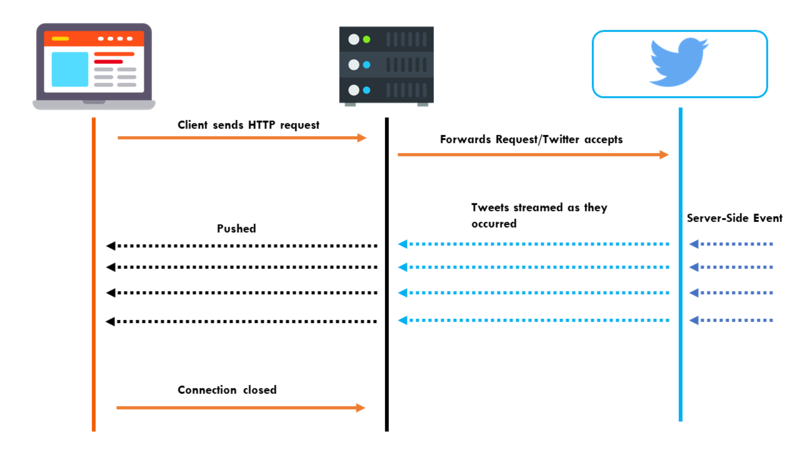 In other words, Fastly serves the same response to Fanout, with those special HTTP headers and initial data, and Fanout sets up a streaming connection with the client. Of course, this is only the connection setup. To send updates to connected clients, the data must be published to Fanout. If an event that triggers a publish causes the origin server response to change, then we may also need to purge the Fastly cache. For example, suppose the “value” that the /stream endpoint serves has been changed. The new value could be published to all current connections, but we’d also want any new connections that arrive afterwards to receive this latest value as well, rather than the older cached value. This can be solved by purging from Fastly and publishing to Fanout at the same time. If your publishing data rate is relatively high, then this can negate the caching benefit of using Fastly. An example of this would be a live blog, whereby most requests can be served and handled from cache. However, if your data changes multiple times per second (or has the potential to change that fast during peak moments), and you expect frequent access, you really don’t want to be purging your cache multiple times per second. The workaround is to rate-limit your purges. For example, during periods of high throughput, you might purge and publish at a maximum rate of once per second or so. This way, the majority of new visitors can be served from cache, and the data will be updated shortly after. You can reference the Github source code for the Fastly/Fanout high scale Live Counter demo. Requests first go to Fanout, then to Fastly, then to a Django backend server which manages the counter API logic. 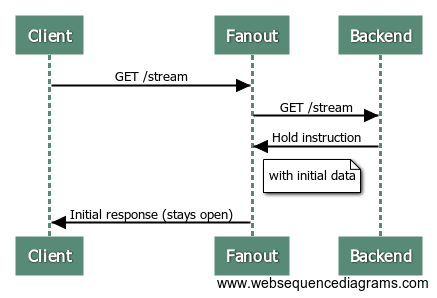 Whenever a counter is incremented, the Fastly cache is purged and the data is published through Fanout. 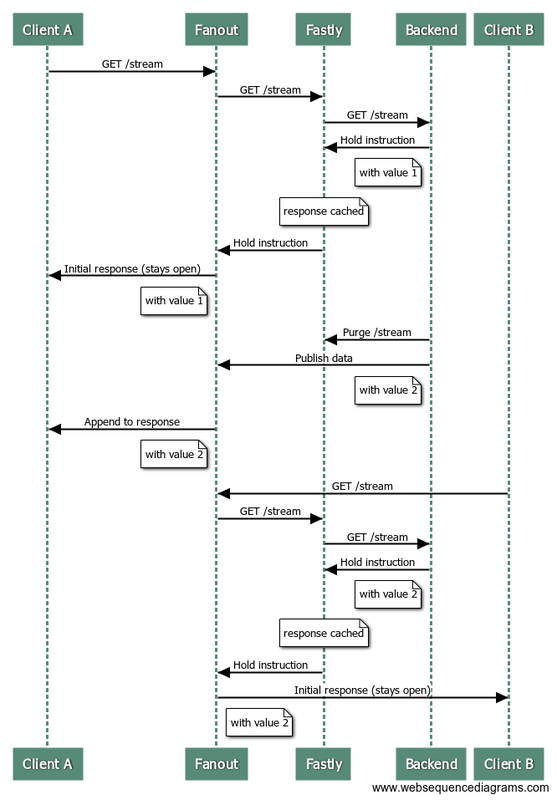 The purge and publish process is also rate-limited to maximize caching benefit. Final Thoughts: The Emergence of a Messaging CDN? 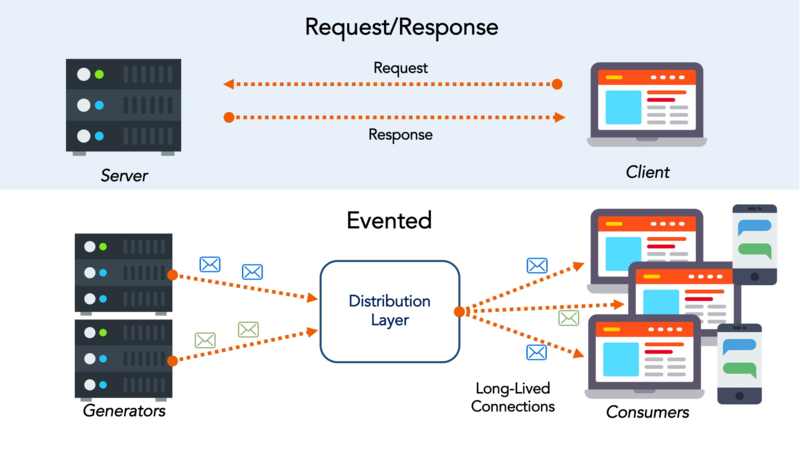 Broadly speaking, we could define a messaging content delivery network as a geographically distributed group of servers which work together to provide near realtime delivery of dynamic data and web content. This new genre of CDN could allow data processing to take place at the edge, away from an app’s origin — thereby ushering in a new era of realtime computing that is both affordable and scalable. In this Forbes’ article, Tom Groenfeldt discusses the emergence of the realtime payment ecosystem and its demand on the realtime API environment. 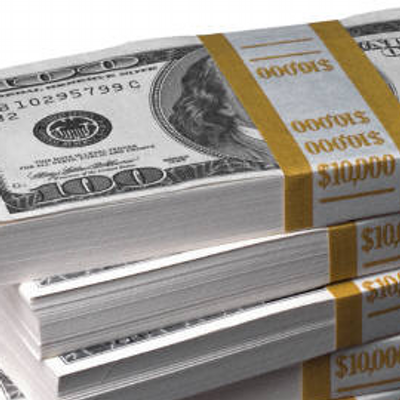 Faster payment systems are being adopted in countries all around the globe even though there is no compelling ROI argument for them, according to the fourth annual Flavors of Fast payments study from FIS. In fact, many of the innovations accompanying faster payments are not about pure speed but other attributes such as 24x7x365 operating hours and standards like ISO 20022 that support data like invoices moving with payments or requests for payments. Fanout Cloud is for high scale data push. Fastly is for high scale data pull. Many realtime applications need to work with data that is both pushed and pulled, and thus can benefit from using both of these systems in the same application. Fanout and Fastly can even be connected together! Using Fanout and Fastly in the same application, independently, is pretty straightforward. For example, at initialization time, past content could be retrieved from Fastly, and Fanout Cloud could provide future pushed updates. What does it mean to connect the two systems together though? Read on to find out. Cached initial data. 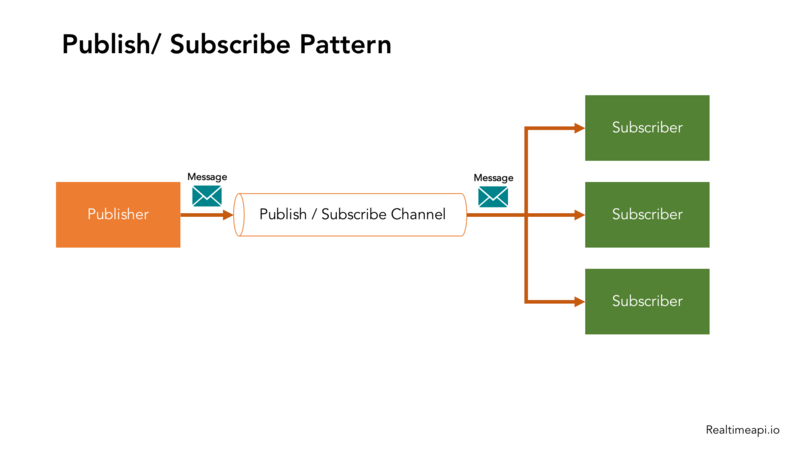 Fanout lets you build API endpoints that serve both historical and future content, for example an HTTP streaming connection that returns some initial data before switching into push mode. Fastly can provide that initial data, reducing load on your origin server. Cached Fanout instructions. Fanout’s behavior (e.g. transport mode, channels to subscribe to, etc.) is determined by instructions provided in origin server responses, usually in the form of special headers such as Grip-Hold and Grip-Channel. Fastly can cache these instructions/headers, again reducing load on your origin server. High availability. If your origin server goes down, Fastly can serve cached data and instructions to Fanout. 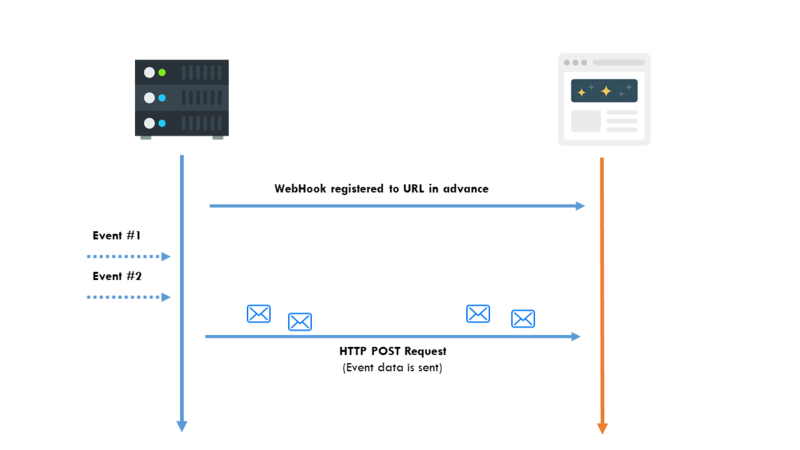 This means clients could connect to your API endpoint, receive historical data, and activate a streaming connection, all without needing access to the origin server. Now, guess what happens when the next client makes a request to the /stream endpoint? That’s right, the origin server isn’t involved at all! 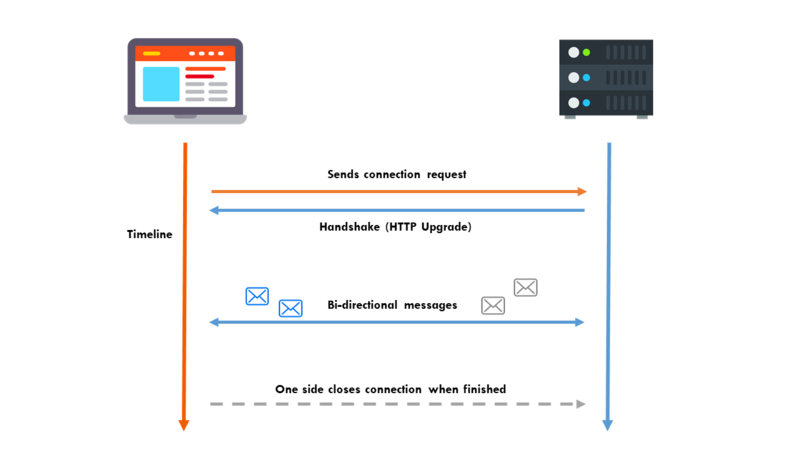 Fastly serves the same response to Fanout Cloud, with those special HTTP headers and initial data, and Fanout Cloud sets up a streaming connection with the client. Of course, this is only the connection setup. 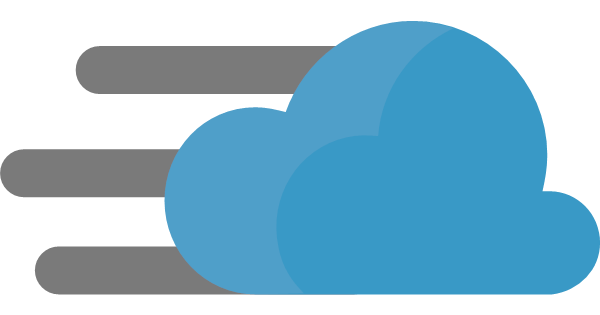 To send updates to connected clients, the data must be published to Fanout Cloud. We may also need to purge the Fastly cache, if an event that triggers a publish causes the origin server response to change as well. For example, suppose the “value” that the /stream endpoint serves has been changed. The new value could be published to all current connections, but we’d also want any new connections that arrive afterwards to receive this latest value as well, rather than the older cached value. This can be solved by purging from Fastly and publishing to Fanout Cloud at the same time. At the end of this sequence, the first and second clients have both received the latest data. One gotcha with purging at the same time as publishing is if your data rate is high it can negate the caching benefit of using Fastly. The sweet spot is data that is accessed frequently (many new visitors per second), changes infrequently (minutes), and you want changes to be delivered instantly (sub-second). An example could be a live blog. In that case, most requests can be served/handled from cache. If your data changes multiple times per second (or has the potential to change that fast during peak moments), and you expect frequent access, you really don’t want to be purging your cache multiple times per second. The workaround is to rate-limit your purges. For example, during periods of high throughput, you might purge and publish at a maximum rate of once per second or so. This way the majority of new visitors can be served from cache, and the data will be updated shortly after. We created a Live Counter Demo to show off this combined Fanout + Fastly architecture. Requests first go to Fanout Cloud, then to Fastly, then to a Django backend server which manages the counter API logic. Whenever a counter is incremented, the Fastly cache is purged and the data is published through Fanout Cloud. The purge and publish process is also rate-limited to maximize caching benefit. The code for the demo is on GitHub.